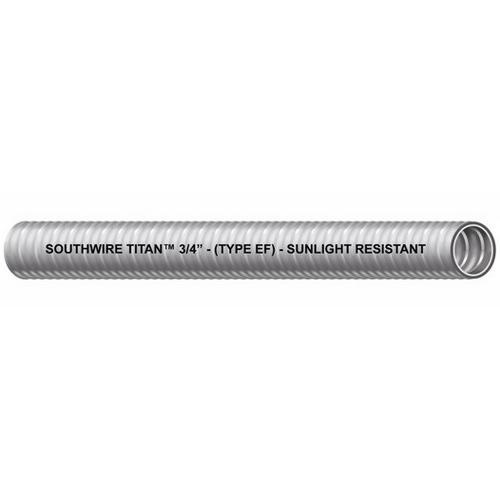 Southwire Titan® Extra-flexible liquid-tight conduit in gray color, has trade size of 3/4-Inch. This 500-ft conduit with PVC jacket, has steel construction and galvanized finish for longer service life. It has smooth metal interior to make wire pulling easier. Conduit with bend radius of 4.25-inches, has outside diameter of 1.03 - 1.05-Inch and inside diameter of 0.82 - 0.84-Inch. It is resistant to weather, heat, oil and chemical breakdown. It withstands temperature range of -10 to 60 deg C. Liquid-tight conduit is suitable for use in industrial and commercial applications such as conveyors, blowers, cranes, air conditioners, machine tooling and lubrication equipment.